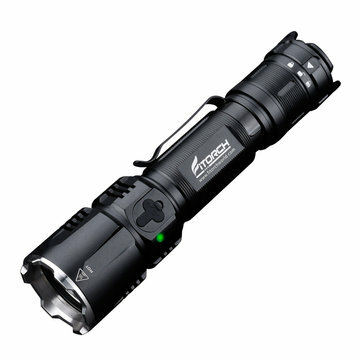 - Maximum output of 1800 Lumen and 302-meter beam distance. - 4 colored light filter discs to change the tint of the light (Red, Green, Blue & Orange). - 3-Way tail switch to activate the Strobe and Turbo modes in one easy step. - Side switch controls 5 illumination levels (Turbo, High, Medium, Low, & Ultralow) and Strobe. - Micro USB port for recharging. - Built in power level indication LED in green, amber and red color. - Coated tempered glass lens resists impact while providing high light transmittance levels. - Metal filmed reflector to create a high intensity beam.